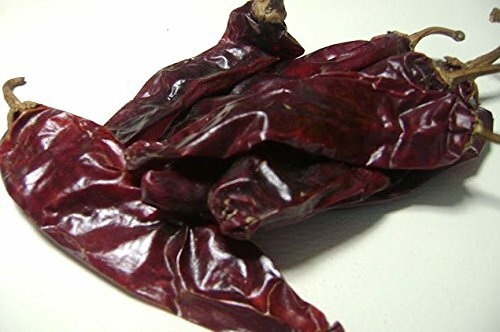 Guajillo chile peppers are very common to Mexican cooking. Along with anchos, they’re the most commonly used chiles in Mexico. What the anchos are to ‘deep’ and ‘rich’, guajillos are to ‘spicy’ and ‘dynamic’… a puree of toasted, rehydrated guajillo sings with a chorus of bright flavors that combine spiciness, tanginess (like cranberry), a slight smokiness and the warm flavor of a ripe, juicy, sweet tomato; the flavors go on and on. The Guajillo chile pepper rates between 2,500 and 4,000 Scoville units on the heat index. Its fruit is large and mild in flavor, with a small amount of heat. They are used to make salsa for tamales. The dried fruit is seeded, soaked, smashed to a thin paste, then cooked with salt and several other ingredients to produce a thick, red, flavorful sauce.